Public art can be found in any form and is not entailed to any category or style. We often see the concretization of artists’ imagination into realities as they work with the environment to produce phenomenal works. In this three part series about public art, we will embark on a journey across different places in the world to find the best public installations created. Eye-catching public artworks such as Big Yellow Rabbit created by Dutch artist, Florentjin Hofman, are able to bring great joy to the public. On the other spectrum, the Holocaust Memorial of the Greater Miami Jewish Federation in the Miami Beach is part of a historical monument in remembrance of a tragic period. Varying in its purpose and location, public art brings identity, beauty and remembrance to its site. Anish Kapoor’s Cloud Gate has caught much attention after its installation. The unique architecture inspired by the shape and form of liquid mercury, is now a tourist spot at Millennium Park in the Loop, Chicago where visitors can be seen taking selfies and photographs. Dubbed as The Bean due to its shape, its reflective surface captures the altered yet stunning skyline of the city. Every piece of art has a story to tell. Mauro Perucchetti’s Jelly Baby Family is one that speaks initially about the social issues of cloning and his dilemma behind it. Presently, tapping on their childlikeness, Mauro Perucchetti sees the Jelly Baby Family as one that represents the importance of family unity and togetherness. Featured in many places including The Louvre in Paris and just outside Plaza Singapura in Dhoby Ghaut, Singapore, this vibrant piece of public art by Mauro Perucchetti no doubt livens up the urban infrastructure of a city. Shandu, the buried Rhino is collected by the the world’s largest open-range zoo, Monarto Zoo in South Australia. It is a public sculpture that Gillie and Marc had created which shows how passionate they are regarding animal conservation. Displayed during the Sculpture by the Sea event held at Bondi Beach in 2016, Shandu, the Buried Rhino was awarded the Allen’s People’s Choice Award and the Kids’ Choice Award. Gillie and Marc donated all of the prize money to The Australian Rhino Project (ARP) in their effort to conserve the rhinos. Antony Gormley is one of England’s most prominent public art sculptor. Many of his large-scale commissioned works have philosophical significance about mankind. One of his most public sculptures, Angel of the North, is one that embodies the spirit of all mankind. An enduring ambition we have is the ability to fly, the strength to achieve things that are beyond our capabilities. Bearing semblance to the fabled angel, it is 20 metres tall and spans 54 metres, comparable to the wingspan of a jumbo jet. This magnificent piece of art at the town of Gateshead in North England is one the world’s most viewed artwork, receiving more than 33 million visitors every year. Another Place is a public artwork at Crosby Beach, that consists of 100 cast iron figures modelled after the artist’s own body proportions, placed along the shore at different proximities from the coastline. Unanimously facing the horizon over the ocean, Gormley exposits the collective human spirit, relating humankind to our roots in the ocean. The figures are subjected to forces of nature, the shadows cast by the sun, the surf of the tide’s ebb and flow, the growth of sea organism, and the corrosion of iron over time. Most artists would have one defining artwork that shoots them to prominence and for 1993’s Turner Prize winner, Rachael Whiteread, House is that artwork. House, is a concrete cast of a Victorian terrace house. Wet concrete was poured in to fill the negative spaces of the house, before the actual house was demolished, leaving the cast to stand as the actual work. While some may hesitate to consider it as a piece of art, many critics praised the work, calling it imaginative. The work speaks about London’s rapid urban change, as she creates an impression of something that no longer exists. Furthermore, Rachel Whiteread leverages social commentary, a core purpose of art today, to create an artwork that serves as a monument for the victims of the Holocaust. Located in Vienna, Nameless Library is a harrowing reminder of the torment that wars bring. Many visitors will discover that the uncanny facade of the library is actually complete shelves of books with spines faced inwards, leaving the viewers clueless about their content. This is the artist’s ingenious attempt to portray the masses of unknown victims who suffered persecution - a reflection of humanity’s dark past. New York City’s public art scene is one of the most extensive - featuring local and international artists in streets and parks. Although New Yorkers have been pretty accepting towards public art, there was one controversial piece is. Tilted Arc by Richard Serra was perceived by many as a depressing piece with its dark hue and the public had to constantly avoid collision with the 37 metres long piece. 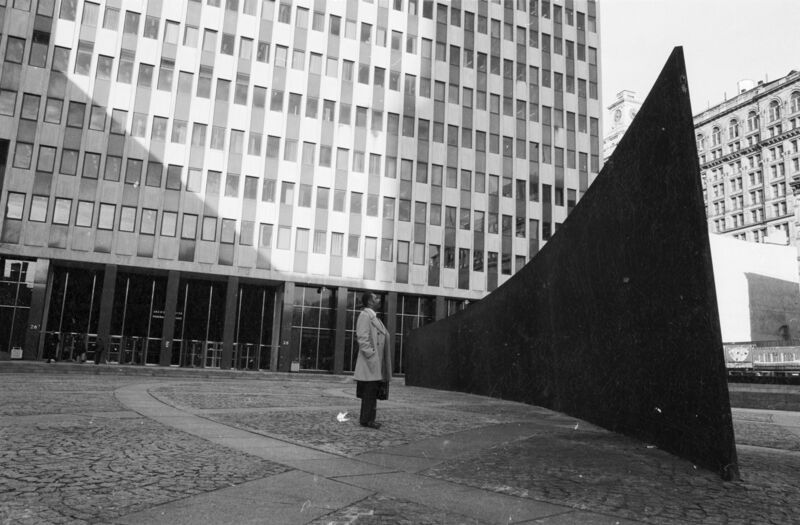 It was removed 8 years later, in 1989, and the site-specific artwork was relocated, losing its essence that Richard Serra initially wanted. Up on the papers not long ago, Ai Weiwei, a Chinese political activist and artist will launch a series of installations around New York City for Good Fences Make Good Neighbours public exhibition. The public exhibition will commence on October 12 this year and it will be Ai Weiwei’s largest public art project yet. Commissioned by the Public Art Fund, this series is a reference to Mending Wall, a poem written by Robert Frost, that uses the phrase “Good Fences Make Good Neighbours” as a cryptic refrain. With the increase in the closure of borders all around the world despite globalization, this phenomenon inspired Ai in the creation of the Good Fences Make Good Neighbours. This can be something we look forward to seeing as public art continues to reflect our gradual societal changes and maybe we should learn how to slow down our footsteps and appreciate the public art around us in essence, looking beyond its aesthetic beauty. In a nutshell, public art has its way of bringing life and joy to a mundane, regular common space. As we discover more about the developments of public art in the up coming article, stay tune to explore the interesting changes contemporary artists has introduced to our public art!